Borderheight: BorderHeight sets the height of the border above and under the barcode in pixels. The border is painted in the current background color (BackColor). 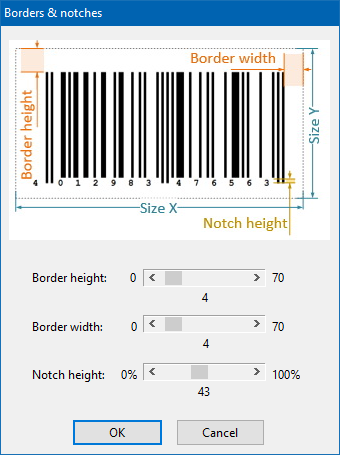 BorderWidth: BorderWidth sets the width of the border on the left and the right of the barcode in pixels. The border is painted in the current background color (BackColor). Notch height: Sets the length of the notches in percent.